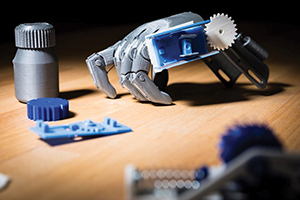 Engineers at the University of Wisconsin have developed 3-D printed gears that are able to track and store information without the use of electronics. The system uses a method called backscatter, through which a device, including a prosthesis, can share information by reflecting signals that are transmitted to it with an antenna. The system uses 2 antennas that can be contacted by a switch attached to a gear. Movement is captured when the switch contacts one of the two antennas, and the teeth of each gear carry specific messages. The team also printed an e-NABLE prosthetic hand with a prototype of their bidirectional sensor that monitors the hand opening and closing by determining the angle of the wrist. The next step in the research is to reduce the size for more real-world testing, Mankoff said.